RG-59 75 ohm coaxial cable with stylish silver jacket. Please note these cables are packaged as composite video cables, digital audio cables and composite video cables are identical 75 ohm coaxial cables and can be used for either signal type. 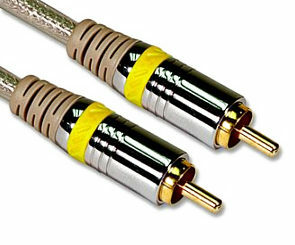 A high quality interconnect cable for digital audio or video with a single phono / RCA connector each end. The lead is manufactured from oxygen free copper (OFC) RG59 coaxial cable and provides fantastic digital and video performance. 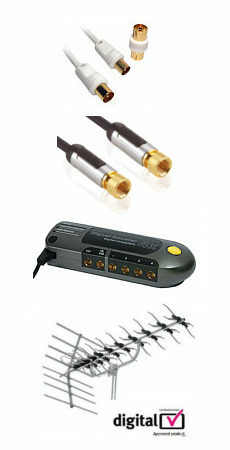 Featuring metal body connectors with gold plated contacts for the ultimate in signal transfer. This cable is particularly suited for digital audio between devices such as DVD players and amplifiers or video applications. A High Quality 3.5mm Jack Plug to 2x Phono cable. Manufactured from Oxygen Free Copper cable. Colour coded high quality moulded phono plugs and 3.5mm jack plug with gold plated contacts. Ideal for hi-fi and audio applications, great for connecting an Ipod to a hifi. Profigold PGC3300 High Performance Component Video Cable on Reel 50m. 3 x 25/0,12mm 99.996% Oxygen Free Copper Multiple braided Shielding High Quality AFPE insulation Anthracite superior flexible outer cable jacket Diam 3 x 6.0mm Meter marking. Techlink 680185 5m Scart Cable, Round Cable Scart Lead with OFC Cable and Gold Plated Contacts. High-end performance at an unbelievable price. Double shielded non-migratory Oxygen Free Copper conductors throughout. Individual Al-Mylar Aluminium foil shielded signal cables for improved picture and sound-to-cable signal migration. Flexible PVC outer jacket to bend and fit into the tightest of spaces. Laser etched chrome plated metal scart connectors. High quality 2x phono to 2x phono leads. Metal body connectors with Gold Plated contacts. OFC cable with colour coded connectors. Ideal for stereo audio connections.